I’m on a fried onion kick. I’ll get bored eventually. 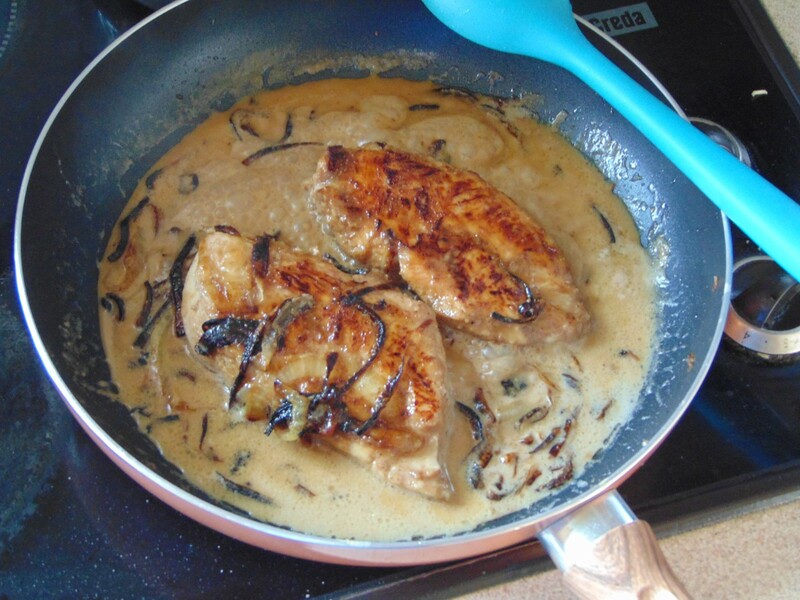 This style of post has proved useful, Dear Reader, I play around with various recipes in the usual course of weekly meal preparation and being able to share old recipes like this is useful. The Cinnamon Chicken Rub is about four years old, according to the creation date of the text file, yes, I really keep them all in the most basic way possible, which in terms of recipes is ancient. I honestly forgot about this, I generally use the Sweet Sweet Potato Seasoning whenever I want a “sweet” cinnamon flavour. I often think that my recipes are a fine line between stew and smoothie. You can play with the balance of sweetness in savoury recipes and dance long the knife’s edge between a caramel sauce and a rich, but sweet sauce, I have eaten chicken in an accidental caramel sauce and that is not recommended, here the onions cut the cloying sweetness and searing the honey slathered chicken adds a slight burnt taste. 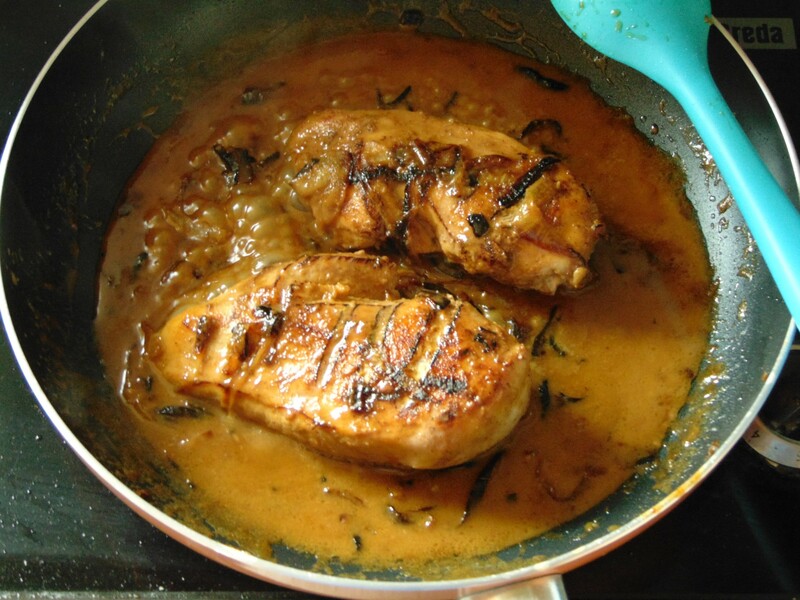 I really sat there last night scribbling at a crossword thinking this up, knowing it’d be worth a try if nothing else, I was prepared to sit down to a caramel chicken again, but thankfully it worked out. As lax as I may seem, Dear Reader, I never put you onto a bad thing. This really takes a while to reduce. So, I love the loose format of these, it’s freeing, you need the rub, as is, with about a tablespoon of honey, mix all that in a bowl and slash some chicken breasts, then smush everything together, it might take a little bit of mixing to make it adhere, but you’re adding the marinade anyways so don’t worry too much. I fried the onions, add a pinch of salt too, I think it draws out the moisture, in olive oil rather than butter, I like either, but it changes the taste, while you’re doing that cut rounds of sweet potato and toss them in extra virgin olive oil and the aforementioned sweet sweet seasoning, in the oven, at 175c Fan, for about forty five minutes, turning occasionally, None of this is exact, Dear Reader, just me ad libbing, so, onions until they’re starting to brown, rice is Whole Grain Basmati, a great recipe I have had from the start, fluffy rice with no draining, add the chicken at a high heat, pouring over whatever is left in the bowl, cook both sides for two minutes, then reduce the heat, let the pan cool a little, and add the coconut milk and just gently simmer until it reduces and darkens. Flip the chicken now and then. Silly presentation are my milieu. 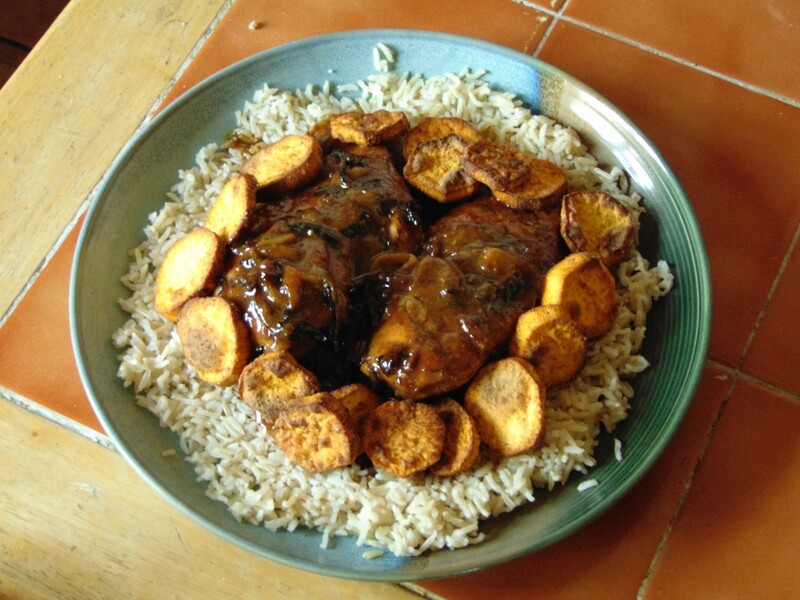 So you end with with a sweet, salty dish that really is a mixture of various kinds of sweet, the scorched honey, softened by the coconut milk’s fattiness, the sweet potatoes natural sweetness enhanced by the sweet seasoning and the natural sweetness of slightly caramelised onions. None of it cloying or too sickly, just a lovely duality of sweet and salt fighting it out on your taste-buds, with tender, moist chicken and fluffy, light rice. Now, I don’t put this up often, but if you ever want to say thank you by buying Dearest Darling Jack a virtual Coffee, you can do so here or via Paypal directly here, if you already have then thank you, I’m extremely grateful. Don’t ever feel the need to do more than you can, Dear Reader, I just put it out there because in-spite of the light tone I do put a lot of effort and work into the site. I’m not here to make money, I probably couldn’t even if I tried, though it may be possible if I were to restrict access to recipes and I swear I will never do that. Just remember that a like, share, comment, anything that promotes the site or engages with it helps these recipes spread, which in turn gets them to more Dear Readers who may need them. See? By putting up with me you help people, no need to thank me. Heh. Until later, Dear Reader. Are titles like those the reason I don’t get guest-post invitations? Don’t answer that. Ah, dear Jerk. Sorry. It is yet again me, dearest reader, who else would it be? I’m back with a variation to a simple recipe. 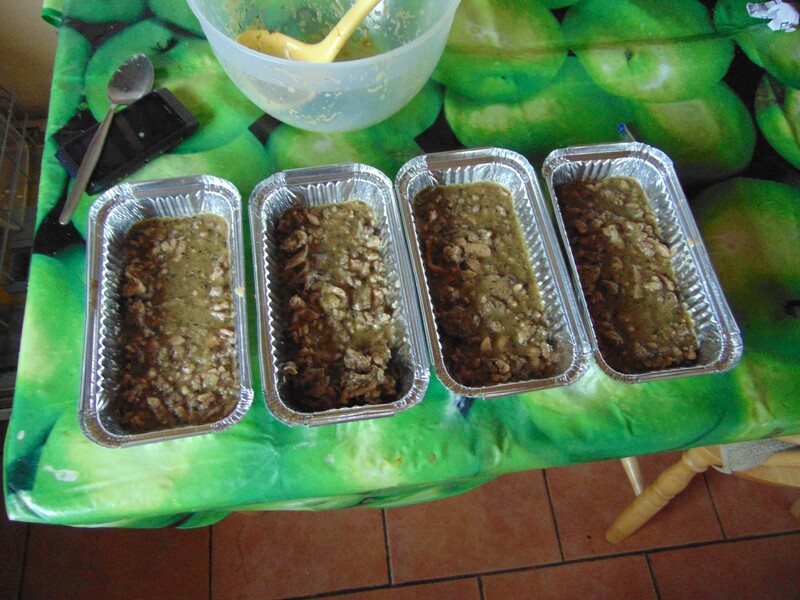 You may know my Jerk Chicken Rub, far from traditional, I assume so at least, I’d never eaten jerked anything before I tried these recipes, but one that cover many diets. Now, we have an oil free option. I’m not in need of oil free recipes, but I know what it’s like to be on a restricted diet that not many follow. Any help is appreciated, right? I repeat it often, but it holds true, that we should dare to try new foods, new methods of cooking and baking because it won’t just enrich our lives and improve our skills it may very well help others. Grandstanding aside, this may be a small blog, but there are a lot of options here, sure you have to dig a little, but nothing worthwhile in life comes easy, dear reader. So, we’ve used these bags to cook chickens, I’ve watched others use those commercial seasoning bags too, but never though to try it myself. I opted for a quick dinner and dumped the vegetables in the bag as well. I did slightly over cook them, it is hard to tell when everything is ready when you can’t open the bag, but I’ll learn in time. 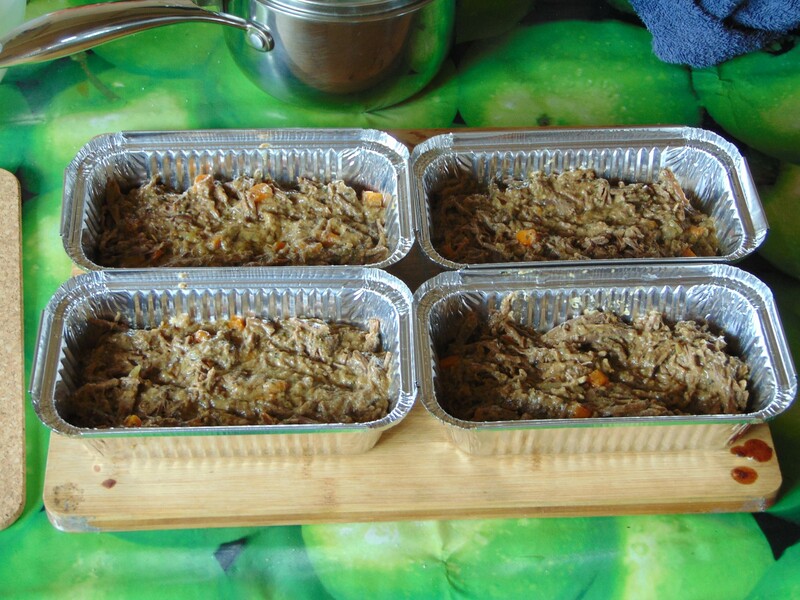 The bag is a nice way to prepare meat or vegetables in a different way from the usual oven roasted. The jerk seasoning was in every bite. There are so many ways to prepare food, so many possibilities in each, it’s a shame when we limit ourselves because we assume because we’re limited in one way and that means we’re limited in every way. In time I’ll learn to time it better and I’ll probably try a few different things in bags. It’s a bit of fun and a way to distract from my long recovery. I’ll see you again, dear reader. Slowly replacing photos, dear reader. I managed to get four harlequin squash topped cottage pies and a further fifteen servings of pesto, so Jack is well stocked up for the squashless, basilless Winter. If the Nutty Banana Bread is varied it can be said that this goes beyond variations. It has options, that don’t just tweak, they change the bread. I recently served the Hokkaido Pumpkin Cinnamon Bread to guests and they were won over. This is, again, a simple recipe that works thanks to the balance of ingredients. 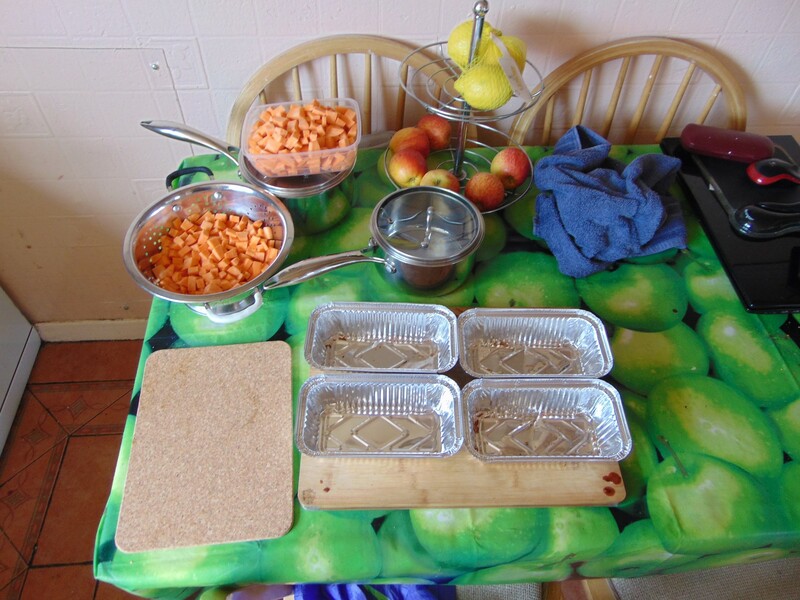 I’ve talked about the preparation on these posts and the vegetable bread is no different. The one great aspect is that you can use steamed vegetables, instead of roasted say, and the results will be as dry or moist as you want assuming you change the amount of water. Folding in vegetable purée gives you body, bulk and taste. It’s a wonderful way to make a meal out of bread and with the sweeter versions it’s also handy way to appease a slight sweet-tooth. The thought of vegetables in bread might be off putting to some,, it was to me once, but when you taste the lovely springy bread, get a hit of whatever spices you’ve chosen and just enjoy the moist, yet firm texture I think you’ll be won over. I’ve talked so much about the basics of these breads, they all share a common origin after all, so there isn’t a lot to say here. The choice of vegetable is up to you of course. I prefer sweeter vegetables like sweet potato or squash. I’ve tried less sweet squash, harlequin, but I think orange fleshed varieties are preferable here. I can’t find a parallel bread to compare this to, that’s not bragging mind, it’s just an interestingly different bread. There are shredded vegetable breads, courgette/zucchini, but to me they’re a different story altogether. The purée melts into the bread and mingles with the flour to create a uniform texture throughout. Nor is it the sweet carrot cake. It’s its own bread. One I’m very proud of and glad to have at hand at all times. I hope in sharing these bread with you, dear reader, that I haven’t oversold them. I find them useful, nutritious and delicious, but I won’t attach any claims to them that I don’t feel true. They’re not going to change your life, nor will they alone help you lose weight or be healthier, they’re just a small part of the diet that I follow. I’ve found them useful and I hope in sharing that someone out there might find them useful too. The problem with having so man recipes is that you can never share them all or present them all the same way. Recipes that have been here since the blogs inception are going to be presented differently from newer recipes, the style I write in evolves, as does my knowledge. In writing up these posts I wanted to just show a little of what I adhere to, there are so many ways to eat healthy and I can’t encapsulate everything I do into a few posts, I can just share a little here and there, stating things as simply and honestly as I can. I hope this helps. That’s all I want really. Perhaps I’ll do this again, dear reader, maybe I’ll do it before this even publishes! Take care and I’ll see you again. This camera makes everything look good. 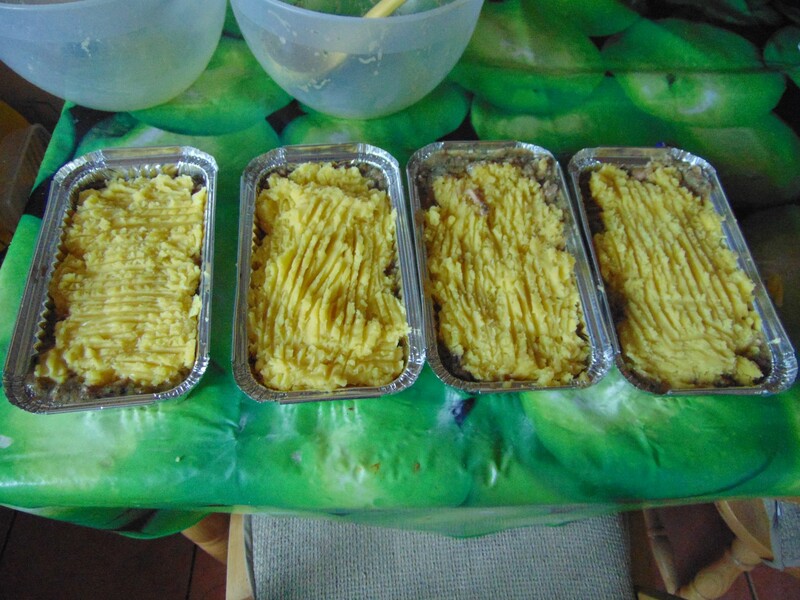 Yes, this is a variation of my BNS Cottage Pie, still a staple dinner for me. This was inspired in part by a pie that’s nicknamed: Paddy Pie. It’s a beef brisket under potato cooked in a wine gravy. A fancy Shepard’s Pie in other words. I thought I could play with that a little to give myself a little variety in my pies. There is an ideal version of this that if my squash grows well I’ll be able to make. 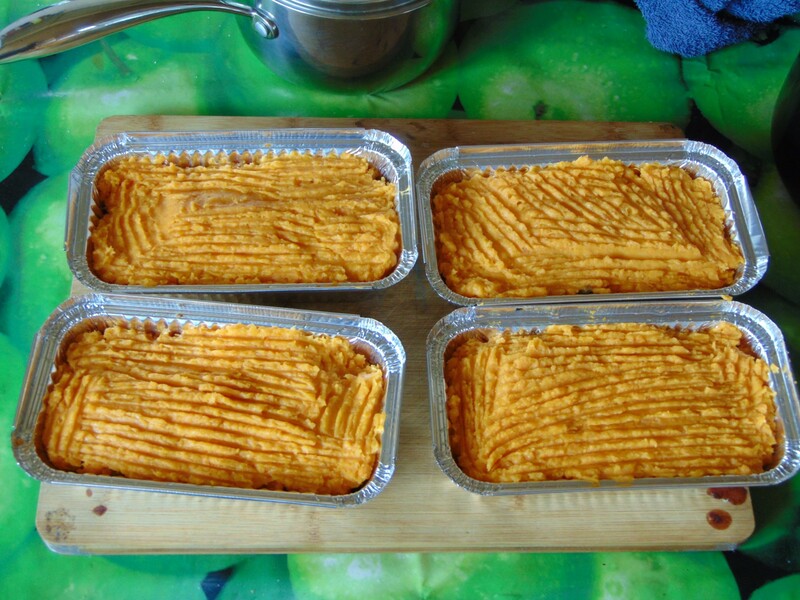 A harlequin topping instead of the sweet potato as it emulates potato perfectly. For now this is more than good enough. There’s nothing extraordinary here, but it covers a lot of intolerances and allergies and gives you a filling, rich, but not too decadent meal. One that can be made in advance, frozen and cooked with no worries of loss in quality. This makes four large servings, but you can makes it however you want. This is one of those recipes, that though it takes time to prepare isn’t all that complex. There are numerous stages, but you can change it at every single one. You could use beef you had left over from a roast, you can add whatever vegetables you’d like. You can fiddle with it and because it’s a really simple, but satisfying, dish you won’t be able to go far wrong. It’s hard to tell if I’ve covered all the necessary steps properly, a lot of this was winged and you can’t always tell if it’ll be clear to someone else. If you have any questions, if anything is unclear just ask. I cook my beef in vacuum bags, sealed with a machine, but I cook it using a rice cooker with a slow cook setting. Fill it with water and the next day you have tender, shredded beef. How you cook the beef is up to you. Just make sure your machine is suitable if you are trying. One of the things I ave to do, but also enjoy doing, is seeing all the way I can use the ingredients that comprise my weekly meals. Nothing here is new, I use all these throughout the week, even using these ingredients to make a more traditional meal. Back in the fat days I used to eat an entire side of beef, which meant that when I stated to move away from those days, to the days of Jack and Roses, beef was left by he wayside. Oh, that’s a terrible image. Beef, abandoned by the side of the road. A roadside roast. Anyway, beef wasn’t something I ate, I couldn’t at first, my gut was healing I’d guess, but my Mother started sous viding her beef and instead of the hard lumps that passed for meat they were tender, juicy beef. Naturally I ad to try and here we are. There will be some cleaning up I’m afraid. So what does a Jack Pie, so tempting to call it that, but I like descriptive names better, taste like? Like beef, in gravy with sweet potato. Heh. Let’s break it down a little. The beef is tender, as you can see in the photo above. It does have a slight dryness to it, but when you combine it with the rich, thanks to the juices, gravy it becomes a juicy, toothsome meat. The sweet potato topping is creamy and distinct enough to work well with the gravy. The cashew butter is the secret to the thick and velvety gravy. As I say I will try this with harlequin squash if possible. If you can tolerate them then potato would be great here. I added carrot to get a little extra goodness, you could also add peas. It’s very soft compared to mince, but I like the different texture. 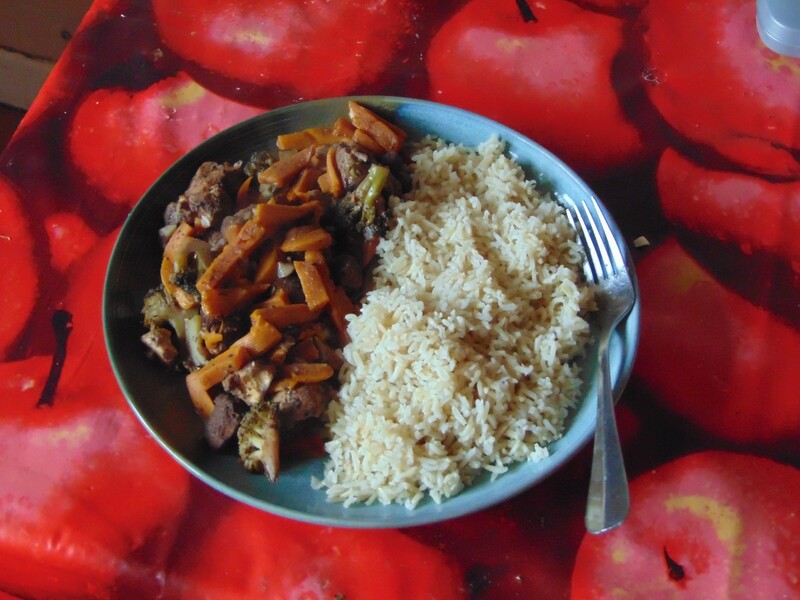 The best way to get a varied diet is to know different ways of preparing the same ingredients. I hope you’ll enjoying look at these photos, reading about the steps and thoughts behind them, maybe even try the recipe for yourselves. Until later, dear reader. I could eat the top when grilled forever. 1. Season the Beef and seal it and the stock cube in a vacuum food bag, leaving room for the juices to accumulate, then using your preferred method cook until beef is fork tender and shreddable. Takes about 16 hours in a slow cooker. When ready sieve and drain Juices into a jug and set aside. 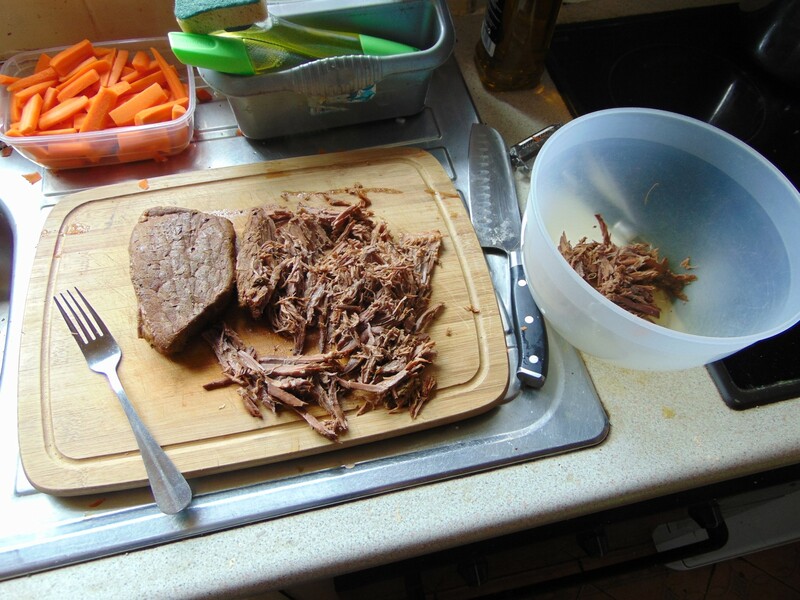 Shred beef with a fork and put into a bowl and set aside. 2. Fry the Onion and Carrot in the Olive Oil until soft, being careful not to burn. Mix together the Herbs, Pepper, Garlic, Cashew Butter and the Stock until everything has combined and the Nut Butter has dissolved. Add to the pot with the Onion and Carrot and bring to a boil, leave for a few minutes, then reduce to a simmer and cook uncovered, stirring as needed, for about ten minutes or gravy has thickened. 4. Add cooked Gravy to Shredded Beef, stirring together until well combined. Spoon into containers. 5. Steam the Sweet Potato until tender and when cooked add to a bowl season with Salt and Pepper then mash until smooth and the stir in Red Cheddar until combined and Cheddar has melted. Spoon mash over Beef mixture. Either freeze or use right away. 6. Cook in the oven at 175c (Fan) for 25 minutes, or until gravy starts to bubble. Then grill for remaining 5 until top is slightly crispy. Any time a photo turns out well you can be sure I just lucked out. Snap ’em and eat is my motto. You take a Peanut Curry as a base idea, you fraction off some Sweet Curry Powder, take a little of a Sweet Mango Curry and here we are. Hold on, dear reader, the hyper-link menu is no longer lagging. You know what this means? I don’t either, but it is pleasant. See? It isn’t all buckwheat. It’s not all wine and roses either, but we have curry. What was it that Archimedes never said? Give me a spoon long enough and a bowl of curry large enough and I’ll feed the world. What? Fake quotes? Misquotes? Me? Never. No never. No more. I am ever and always the bastion of truth, justice and curry. A pillar of society, that’s old Jack. No, not a pill. How dare you? You, wait for it, Twenty Minute Egg! So hard, dear reader, be not cruel to one such as I. I give you so many curries. There seems to be a theme, there are the nut butter based curies, rich and filling. The fruity fares, sweet and saucy. There is also the herb curries, but they’re rather limited and seasonal. Nightshade intolerance might kneecap me in regards heat, but I find other flavour to play with, other salivatory (It’s a word!) sensations to tickle your taste-buds. To delight your dentistry. To, to…beat a dead horse? Okay, onto the main part of my orally-inclined oration. So, nut curries. What can I say that I haven’t said before? Well, one thing I have noticed is that when you make them using coconut cream they become too rich, for me at least. Maybe it’s the ratio of fat to everything else, I’m not quite sure. Unlike my baking recipes you can use any nut butter, just again it might be too oily if you use a, I almost said unnatural, more blended peanut butter. The taste here isn’t as sweet as a fruit based curry, it’s more of a subtle undertone, the nutty flavour is still predominant. The sweeter spices and the honey just add a different backing flavour than the more savoury ones used in my original recipe. 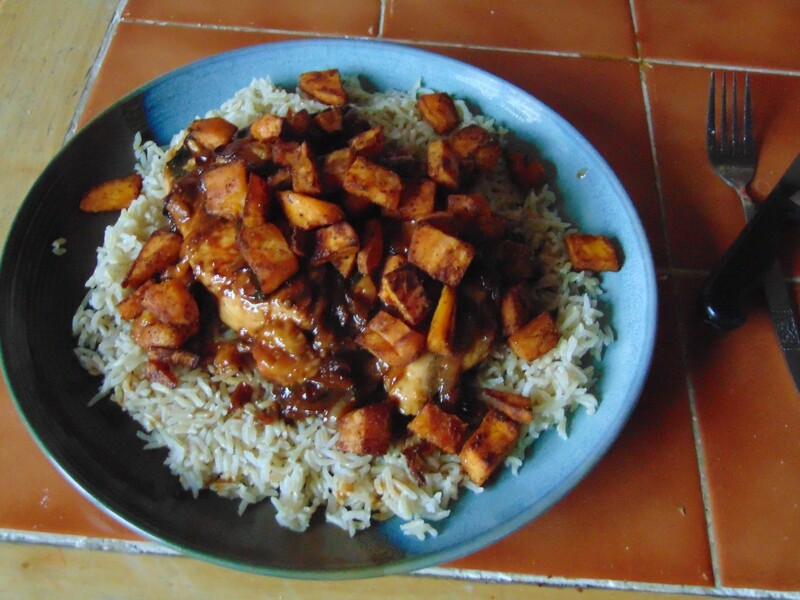 I used the sweet potato for its sweetness and how well it pairs with cinnamon. As does peanut. The ingredients may make it look complex, but it’s all just a matter of complementary flavours and a little experience from other recipes. 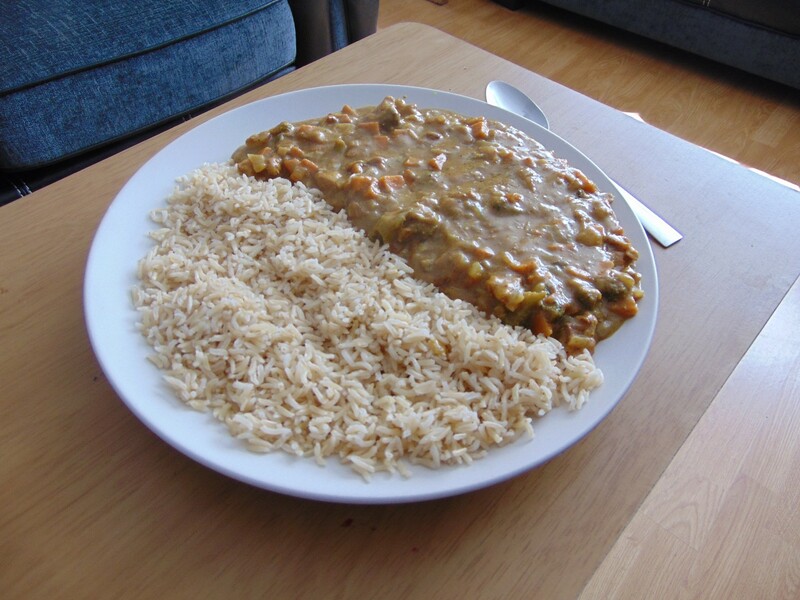 On the whole a really nice curry, simple to prepare and one that keeps you filled. So, that’s that for now. Still more recipes incoming. See you then. 1. Add Olive Oil, Onion and Garlic to a pot, stir together, cover and heat on high until steaming, then reduce to a medium heat and let cook for 10 minutes until soft. 2. Add Spices and stir together, then add Chicken and Sweet Potato stir and cook for 5 minutes. 3. 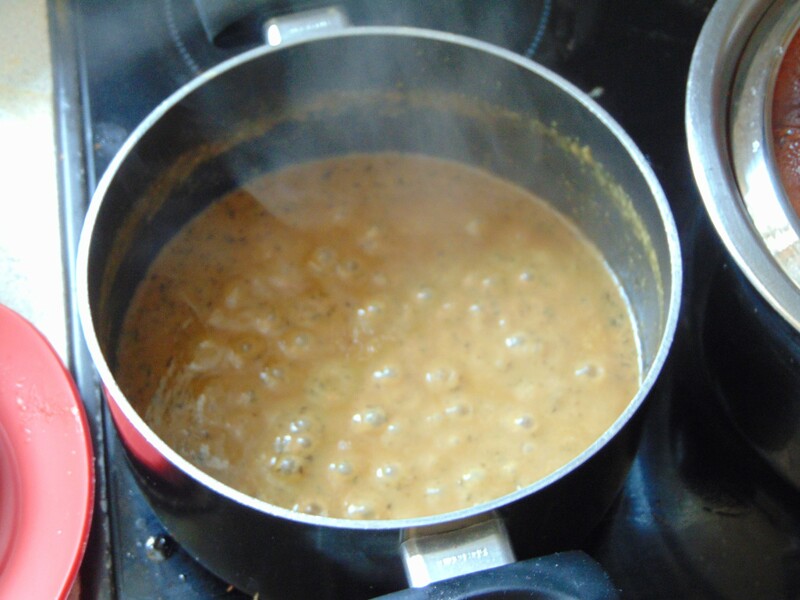 Add Coconut Milk, Honey and Peanut Butter and stir, bring to boil, cover and then reduce to a simmer and cook for 20 minutes.